The Puerto Princesa City Police Office (PPCPO) has released the list of 17 banned firecrackers and pyrotechnic devices with an appeal to the public to stick to safer noisemakers and joining community firework displays to welcome the New Year. 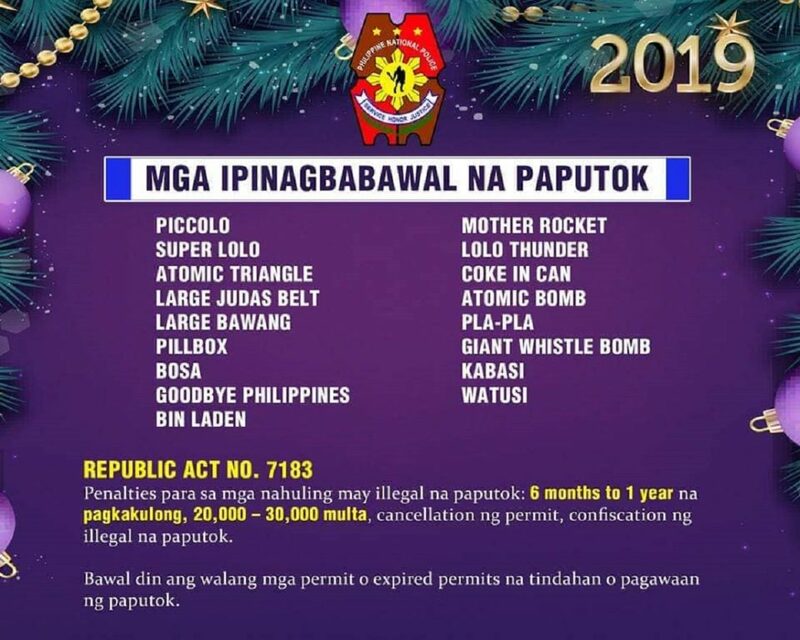 Prohibited are piccolo, super lolo, atomic triangle, large Judas’ belt, large bawang, pillbox, bosa, Goodbye Philippines, Bin Laden, mother rocket, lolo thunder, atomic bomb, coke in can, plapla, giant whistle bomb, kabasi and watusi. Police Officer 3 Analyn Labrador said Friday that residents who will be caught “using, selling, distributing, and manufacturing” these prohibited firecrackers will be slapped a penalty ranging from P20,000 to P30,000. Violators can also face six months to one year of imprisonment. Labrador encouraged the public to use other materials in making noise instead of using firecrackers and other pyrotechnic devices. “Mas i-a-advice natin ‘yong mga paputok na hindi makakasakit… luces puwede naman, ‘yong fountain, ‘yong mga pailaw. Gaya ng mga paingay, torotot, ‘yong mga takip ng kaldero, planggana (We advice that they use those that are not dangerous… luces is okay, fountain, or the sparklers. Noisemakers like trumpets, cooking pot covers, basin),” she said. Labrador added that records show that the police has not arrested any retailer selling prohibited firecrackers since they started their inspections with the Bureau of Fire Protection (BFP) in the city and the Department of Health (DOH). She said the public is welcome to join the New Year celebration at the City Baywalk on December 31. “Pinapaalalahanan na lang po natin ang ating publiko na sa darating na December 31 ay meron tayong designated area para sa ating firecrackers [at] fireworks display, iyan po ay ang ating City Baywalk. Salubong ‘yan sa ating Bagong Taon. Para mas makatipid sila at mas ma-enjoy talaga nila, magpunta sila sa baybay kasi ‘yon naman po ay libre at bigay ng ating city government,” she said. She pointed out that firecrackers that have fuses which can burn in less than three seconds and weighing more than 0.2 grams constitute the list of their identified prohibited firecrackers. Labrador added further that imported and unlabeled pyrotechnics are also considered illegal. “Iyon pong mga 0.2 [grams], ‘yon din ang mga kasama [sa listahan ng mga bawal na paputok]. ‘Yong mga unlabeled and imported pyrotechnic devices, kasama po sila [sa bawal] (Firecrackers that weigh 0.2 grams are included in the ban. Unlabeled and imported pyrotechnic devices are also included),” she also said. Labrador said the PPCPO expects the public to cooperate for a “safe and peaceful” New Year celebration.